These attractive, fresh quilt designs move beyond simple squares and rectangles and all feature Tula Pink's amazing fabrics. The 10 beautiful quilts are all accompanied by fun accessories, varying from eye masks and body pillows to storage bags and curtains. Tula emhasizes and demystifies the way to successfully finish your quilt by using fantastic quilting as part of the overall design. You can learn how to choose and combine fabric, use the colorwheel to its full advantage and love the end results! Step-by-step photographs of quilting techniques help beginners to get started and introduce experienced sewers to a few new shortcuts. Introduction; Tools, Tricks and Terms; Techniques; Fearless Fabric Selection; The Fabric Salon; Quilting is Not an Afterthought; Projects; Twin-Size Quilt + Stuffie; Lap Quilt + Book Bed Hanger; Queen-Sized Quilt + Body Pillow; Crib Quilt + Night Cap; Wall Hanging + Lamp Shade Cover; Queen-Sized Quilt + Pillow cases; Twin-Sized Quilt + Quilt Storage Bag; Full Quilt + Eye Mask with Eye Patch; Lap Quilt + Throw Pillow; Full-Sized Quilt + Curtains; Resources; Index. 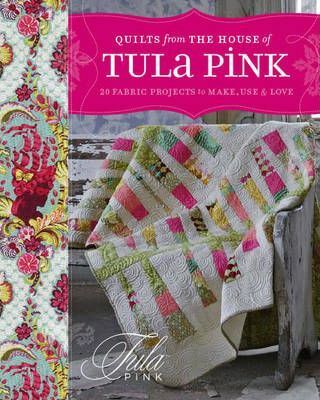 Tula Pink worked as a Senior Designer with Moda, as well as having six collections under her own design label with them. She currently works with FreeSpirit and her most recent line, Parisville, has received rave reviews. She lives in Los Angeles, USA.